Green Mountain environmentalists, social activists and just folks interested in compelling images of the struggle for justice should check out the new photo essay released Tuesday by former Vermont photojournalist Orin Langelle. Titled “Defending Earth/Stopping Injustice — Struggles for Justice: late 1980s to late 90s,” [updated for exhibition] the historical photos trace various ecological and social justice battles waged in North America, including several in Vermont. Langelle, a former Hinesburg photographer and social activist, was profiled by Seven Days‘ Mike Ives in a February 20, 2008 story, “Shutterbuggin’.” He released the photo essay in honor of Earth Day 2014. 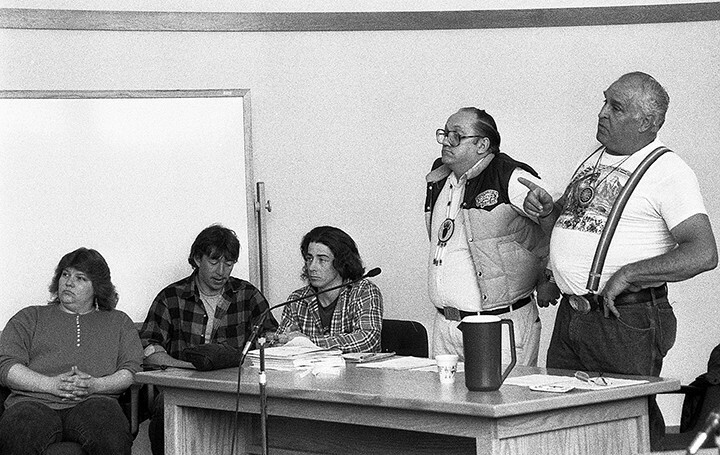 Other photos that may be of particular interest to Vermonters are those involving the Abenaki’s struggle for state recognition in the 1990s (below). Langelle’s support for the Abenaki in the early 1990s, documented in this latest photo essay, led to his adoption as an honorary member of the Saint Francis-Sokoki band of the Abenaki in 1992. Langelle’s photos, which have appeared in publications as diverse as USA Today, the New York Times, the Progressive, the Christian Science Monitor and EarthFirst! Journal, were taken around the world, from the United States to Tasmania to England to Indigenous Peoples’ territories in northern Québec, Chiapas, Mexico, and the remote reaches of Nicaragua. Langelle’s photography is a project of the Buffalo, N.Y.-based Global Justice Ecology Project, which only recently closed its Burlington office.